The November Project Add-On from Swirlydoos is all about a peeled paint technique: basically, using petroleum jelly as a resist while painting in layers. 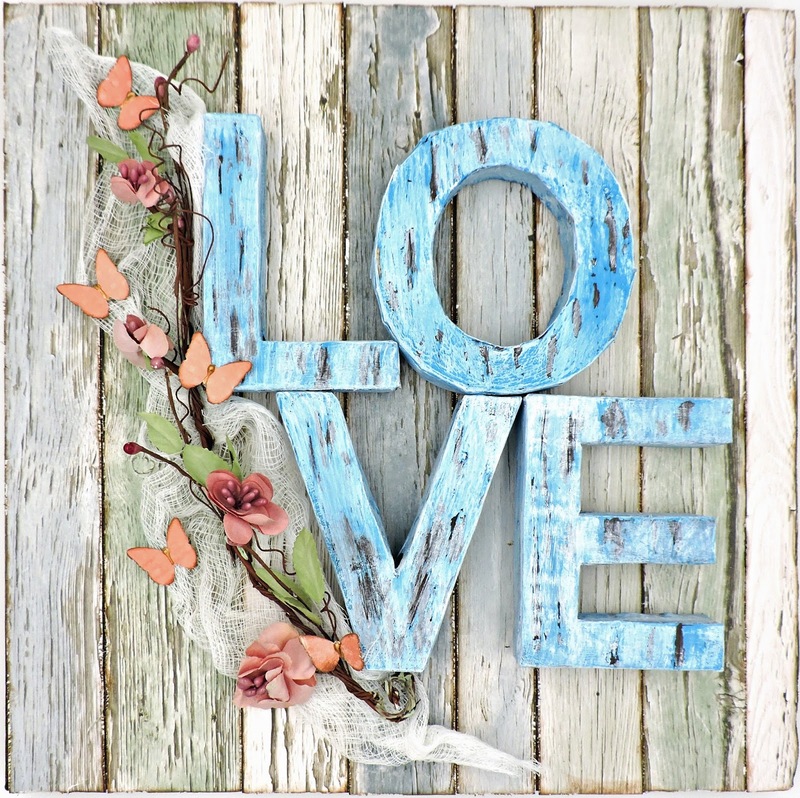 The kit itself contains a 12 x 12 canvas, a set of 3D paper letters from DoCraft, 4 bottles of acrylic craft paint and some matte gel medium, as well as a 9 x 12 wood palette and a 2-inch bristle brush for a second project. I played with a few ideas in my head and in the end, decided to use the B side of Kaisercraft's Barber Shoppe's Comb pattern paper from the Market Street kit as inspiration. To begin, I gave all of the letters a base coat of matte gel, which I allowed to dry. Next came a good coat of Plaid Satin Acrylic in Real Brown. Here's where the inspiration came in: Using a toothpick, I applied the petroleum jelly in up and down streaks to mimic the wood grain pattern of my paper. I let that set for a few hours and went over it all with a very light coat of DecoArt Acrylic in Calypso Blue and left it to dry overnight. With a dry paper towel, I rubbed all of the surfaces that contained the jelly to expose the brown undercoat, then with a baby wipe to make sure the letters were free of grease. And now for the finishing coat: I diluted the Plaid Matte Acrylic in Titanium White with water to make a very thin paint and very lightly went over my letters with a fan brush, rubbing most of the paint off here and there in small spots. Although the canvas is pretreated, I wanted to give it a base coat to show through the strips of paper as well as around the sides. I used the Real Brown acrylic paint, pouring on small amounts here and there, misting it with water as I spread it around as only a thin layer of paint was necessary. The pattern paper was cut into strips along the lines of the design and distressed and inked, then adhered to the canvas. 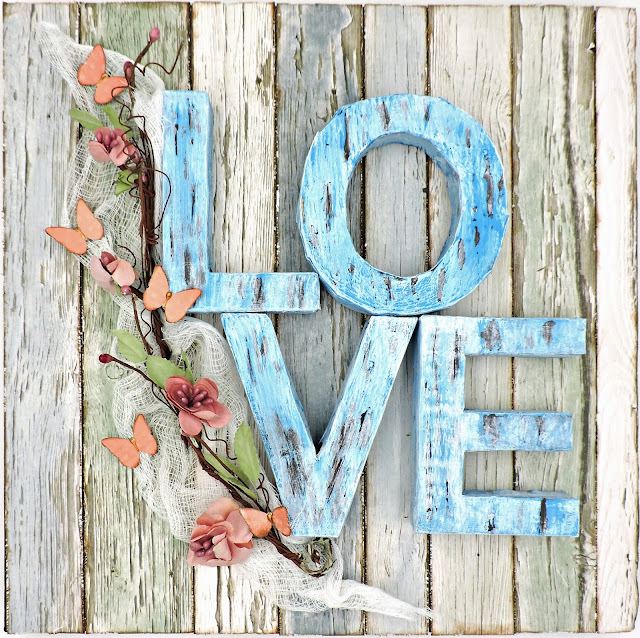 For my final steps, I glued on the letters, then a strip of cheesecloth and a pretty 49 and Market vine from the November Flower Add-On and a few butterflies that I created from scraps with a Martha Stewart punch.